On an overcast July Morning I meet Bob Woodbury, an angler from Salt Lake City, at his downtown San Diego Hotel. Bob is about to embark on his first experience fishing for bay bass on San Diego Bay. We drive across San Diego Bay via the Coronado Bridge and pick up a rental skiff at Glorietta Bay. After a brief lesson in casting shooting heads, we motor over to the bridge that brought us across the bay. After drifting and casting for awhile Bob makes a cast near one of the bridge support pylons. After a few short strips he feels a sudden resistance like he has snagged bottom; then his rod tip begins to dance. The fish he has hooked puts a deep bend into his fast action 8-weight and after a spirited battle, he brings the fish to hand. The size of the fish – or rather its lack of size amazes him. It’s only about ten inches long. Bob has just met his first “Grumpy”, more commonly known as the Spotted Bay Bass. Over the next couple of hours we catch another thirty or so bass and a few other species. The bays, estuaries, lagoons, and other sheltered waters along Pacific Coast of Southern California and Baja California, including the Sea of Cortez, provide excellent light tackle fishing for basses and other species. 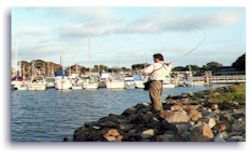 San Diego Bay is a prime example of these fisheries. Little known outside of southern California yet easily accessible to short and long term visitors to the greater urban areas of San Diego and Los Angeles, they’re ready made for the fly angler with only a few hours to fish. The Spotted Bay Bass is the dominant game fish species in these waters but it is joined by the Barred Sand Bass and the Kelp or Calico Bass. When these fish are found together Spotties will dominate the back bays with the Sandies and Calicos being found in greater numbers closer to the ocean. Although not flamboyant in coloration like many other gamefish, Spotties, Calicos, and Sandies are attractive in there own special way. Spotties have brown or tan backs with cream to golden yellow sides and are covered with black spots. They possess a nice set of small, sharp teeth and numerous spines, including one on each gill plate that has surprised many an angler. Spotties reach a size of about 5 lbs. but the ten to fourteen inch fish are the most common. In southern California waters such as San Diego Bay, they will be found around structure such as pilings, docks, channel edges, eel grass flats, and the aforementioned bridge pylons. In some areas, especially in the Sea of Cortez, they may be taken from the beach, particularly near rock formations. I have caught a couple in the surf from San Diego area beaches. Barred Sand Bass have brownish-green backs with bars of the same color running down creamy tan colored sides. There are some small yellow spots on the face and gill plate below the eyes. Like Spotties, Sandies have a set of dorsal spines. Their teeth are not quite as sharp as the Spottie’s. As their name implies, these fish are often found around sandy bottoms; however, they will also be caught over the eel grass flats and around man-made structure. Sand Bass run to about ten pounds but the larger fish are usually taken in the ocean. Five-pound fish, while not common, are caught in southern California bays. Ten to fourteen inch fish make up the bulk of the catch. 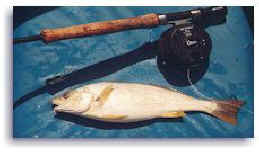 Kelp Bass, also known as Calico Bass by California anglers, are most commonly found around kelp forests and near shore reefs. In bays they will be found around rock piles, channel edges, wrecks, breakwaters, docks, and other man made structure. Calico bass have brown backs with white or cream blotches, blotchy tan and light golden tan sides, and a creamy white belly. As with its cousins, the Calico is armed with dorsal spines and small sharp teeth. Calicos reach about fifteen pounds in the ocean but tend to run on the small side in the bay. Caution is warranted when handling these fish. A firm thumb grip on the lower jaw is usually the best way to grab a fish to remove the fly. Anything less than a firm grip will result in some chafing – and sometimes cuts – on the thumb. I always mash the barbs on my hooks to facilitate the release of the fish. I can often just grab the fly and rotate the hook out without touching the fish. Occasionally a fish, especially Spotties, will clamp its mouth shut with the entire fly in its mouth. If I need to grab a fish to remove the fly I will try to grab in from the belly behind the pectoral fins (watch out for the gill plate spines on the Spotties). A set of needle nose pliers can usually be used to convince the fish to open its mouth. Attempting to insert the pliers with a slight pressure to the lips usually does the trick. 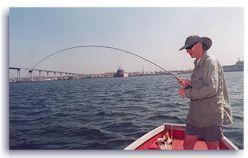 Successfully angling on my home water of San Diego bay requires that the angler adapt his or her tactics to each type of structure and tidal situation. Tides determine the best fishing times. Incoming tides are generally the most productive but don’t ignore the outgoing tide. I have had some excellent fishing at the top of the tide but the bottom has rarely been as productive. The best fishing usually coincides with the greatest tidal swings. Perhaps the easiest areas to fish successfully are eel grass flats in three to twelve feet of water. The grass flats tend to produce best during the second half of the incoming and first half of the outgoing tide. At this time fish will be lying right on the grass waiting to intercept baitfish and crustaceans being swept by the current. Fish will also be found on edges of the flats. The fish are often very aggressive during this stage and strikes will often be jolting. Often I’ve had my running line ripped from my hands when my mind wandered. You to remain alert though, since some takes will be light – nothing more than a loss of contact with the fly. Although takes will come on the sink, I always cast with the goal of getting the fly right down to the grass – if I am not occasionally bringing up some salad I am not swimming my fly deep enough. Strikes will sometimes come as the fly is pulled free from the grass. 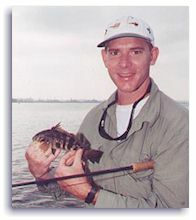 Incidentally, the only species of fish that I have ever caught on a fly fouled with vegetation is the Spotted Bay bass. This has happened on numerous occasions. Iusually drift with the wind and the current over the flats but I will occasionally anchor. Casts can be made the direction of the drift, perpendicular to the drift, or anywhere in between depending on the depth of the water and speed of the current. San Diego bay has large expanses of grass flats that can be effectively drifted regardless of the wind or current direction. When anchored, I will place the boat over the flats near a channel edge where the current is running parallel to the channel. In this situation I make a quartering cast up-current and just beyond the edge. I then let the fly sink and sweep along the edge, retrieving just enough line to maintain contact with the fly. Strikes will comes as the fly drops over the channel edge and is swept along in the current. A an effective tact conventional gear anglers use is to cast and retrieve deep diving crank baits over the grass with a stop and go retrieve. Fly anglers can mimic this with a foam wiggle bug and a fast sinking line. While the grass flats may provide the easiest fishing, visible structure provides the most obvious fishing location. In fact, I usually advise newcomers to fish the bridges since they will put you in the vicinity of flats, deep channels, and hard structure. 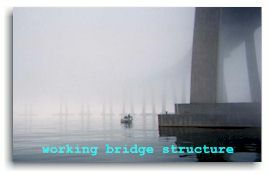 Within the developed bays of southern California such structure is usually man-made: rock retaining walls, breakwaters, jetties, piers pilings, docks, moored boats, bridges, and wrecks. I find it difficult to pass up making a few casts to such structure until I determine a particular item as generally unproductive. More often than not they are productive at some point during the tidal sequence. Fish are often found tight to such structure during slack water period but a bit looser when the tide is moving. Fishing around visible structure often produces the greatest variety of species during an outing as numerous game fish are drawn to the baitfish using it as cover. When casting to visible structure I usually count my fly down to the bottom, perhaps interjecting a strip or two, while remaining attentive for light strikes. If the fly reaches my predetermined count (depth) I will then commence a full retrieve. Most strikes come on the sink or after the first couple of strips. When casting to moored boats I take care to not strike the boat with my cast; most owners are not enamored with anglers blasting their investment with lures or lead eyed flies. Rock walls deserve some special consideration because there are distinctly different types. The first type is rock retaining walls constructed to prevent erosion. These walls often end not much deeper than the low tide mark, if that low. They are usually adjacent to sand or grass flats. Fishing such walls is usually a waste of time. Instead, concentrate on the flats and channels that the walls abut. Deeper retaining walls, breakwaters, and jetties on the other hand provide a haven for myriad sustenance for gamefish. Casts right along the rocks will often result in jarring strikes, especially during the rising and falling tide. When fishing from shore without backcast room, one can employ the saltwater equivalent of high stick nymphing. Just make a short roll cast up-current with a fast sinking line and weighted fly and follow the swing with the rod. The deeper water and channels provide a bit of a challenge to the fly fisher: The conventional angler can use lead jig heads to get his lure down but the fly angler has to rely on sinking lines and drift management to score consistently. Some channels will be fifty feet or deeper but fortunately we do not usually have to resort to fishing this deep. Hungry bass will move up in the water column to feed on schools of baitfish as they move through with the tides, often right to the surface. Although large bass and halibut can be hooked near the bottom of the center of the channel, the edges are usually the most productive. This typically means fishing in water ten to thirty feet deep. It is often necessary to cast a fast sinking line down drift (ahead of the drifting boat) in order to allow time for the line to sink before the boat passes it’s entry point and begins to drag it upward out of the strike zone. Depending on the desired depth, the retrieve can be initiated at any point at or beyond where the fly entered the water. Finally, bait receivers are worthy of the angler’s attention. Constructed and operated to service the general public and the sportfishing fleets, bait receivers attract all sorts of wild life looking for an easy meal from spilled or discarded bait. This includes birds, sea lions, and game fish. Sometimes cold, sometimes hot, it is usually worth your time to make a few casts around the receivers – you never know what you might hook up. By far the best fishing platform is a boat of some type. Boats will generally provide the greatest range and flexibility. Float tubes or pontoon kick boats can be employed in protected waters and are especially useful around marinas. The float tuber needs to be aware of the wind, tides, and boat traffic. Wearing bright clothing will help make you visible to boaters and a whistle is a handy warning device. A proper personal flotation device should be considered standard gear. Failure to carry one could be harmful to your wallet as well as life since the Coast Guard or Harbor Police on San Diego and Mission bays will cite tubers without one. Kayaks are gaining in popularity too and are perhaps the best platform for fishing the channels surrounded by shallow grass and mud flats such as those found in the southern reaches of San Diego Bay. Whenever fishing from a watercraft, it pays to keep your eyes moving about as if your head was on a swivel because you will be sharing the water with other craft from dinghies to Aircraft Carriers. Not everyone operating these vessels is as attentive as they should be. Shore and wade fishing opportunities are minimal in San Diego Bay but there are a few beaches that may be fished in this manner. There are many inviting looking rock embankments but for the most part it is difficult to make long enough cast to hit productive water from these locations. Bay bass feast on a cornucopia of tasty critters including anchovies, smelt, shrimp, mussels, crabs, and marine worms. Our flies should be chosen to imitate these food items. If I were limited to one fly for bay bass, it would be a size four chartreuse and white Flashtail Clouser Minnow that is about two and a half inches long including the flash tail. It is fun to use other patterns of course and a host of them are productive. 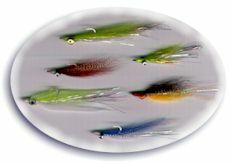 Standard Clouser Minnows, Deceivers, Alfs, Flashtail Whistlers, Sar-Mul-Macs, Sea Habits, Woolly Buggers, crab patterns, shrimp patterns, wiggle bugs, and spoon type flies are just a small subset of the patterns that will work. Chartreuse is always an excellent color choice but others include all white, blue/white, green/white, gray/white, red/white, red/yellow, and rust/orange. All patterns seem to be improved in their efficacy with the incorporation of some flash. Fly sizes range from a one-inch long pattern tied on a size 8 hook to a 5-inch long pattern tied on a 3/0 hook. I hesitate to use flies on a hook smaller than size four since the fish often inhale them but I occasionally do. Larger flies will catch fewer fish, but the average size of the fish will increase. Conventional anglers often use five-inch long plastic swim baits with deadly effect and a large Flashtail Whistler, Deceiver, Spinster or Sar-Mul-Mac can best approximate these lures. Fly delivery: Five- to nine-weight rods will do the job nicely. At the lighter end of the scale, the five-weight will be ok for most of the smaller bass. It will be a bit light if you are fortunate enough to tie into a really large fish, like maybe a legal size halibut, white sea bass, or barracuda. At the other end of the scale a nine-weight will be a bit heavy most of the time but it is ideal for handling lead core lines used for plumbing the depths or working fast currents. A seven-weight is a good all around choice. Asystem of interchangeable shooting heads provides the most versatility in a fly line system for bay bass fishing. I like to use standard heads with a 3- to 4-inch per second (ips) sink rate, 5- to 6-inch rate, and a lead core head made from Cortland’s LC-13 (about 8 ips) for deep presentations. A coated shooting line like Scientific Angler’s Master Saltwater shooting line in the .035” diameter is a good all around shooting line for bay work. A monofilament shooting line like Amnesia® is useful for deeper presentations since its smaller diameter permits quicker penetration of the water column. While not actually shooting heads. special sinking lines with incorporated running lines such as the T and TS series from the Teeny Nymph Company and similar lines from Cortland, Rio, Orvis, Scientific Angler’s may also be used. Additional reels or spools will be necessary however, if different densities are needed. Ten or thirteen foot sink tip lines have limited applications over the flats in shallow water. Rarely can a floating line be employed as most of the action is below the surface, even when baitfish are being pushed to the surface. Leaders can be kept short and simple. A four-foot length of 8-, 10-, or 12- pound test monofilament looped directly to the end of the fly line is sufficient. I use a Bimini knot to form a doubled line that is then formed into a doubled loop with a surgeon’s knot to create an end loop for the leader. This is probably overkill for this type of fishing but I make leaders and tippets ahead of time so they will be available for any type of fishing. I will usually not replace a leader until it is cut back below 24”. Bay bass do not seem to be leader or line shy. It is important to monitor the condition of the leader as rocks, pilings, and the teeth of the bass will abrade the leader. Most flies perform better if attracted with a loop knot such as the Duncan Loop or Non-Slip Mono Loop Knot. If you wish to keep it simple, just tie a Surgeon’s loop into one end of a 6-foot length of 20 pound mono and loop it to your head. Any good loop knot, such as the Non-slip Mono loop will suffice for attaching the fly. Bay bass, and most of the other species that you may catch incidentally, are not dragsters. Most will be hand stripped to the boat. Accordingly, high cost reels are not necessary. Almost any well made reel with a solid drag mechanism, either disk or click type, will suffice and will last a long time with proper maintenance. Ahost of assorted accouterments are useful when pursuing bay bass: Navigational charts are indispensable for quickly identifying potentially productive areas. Charts exist for most southern California bays. Even if you don’t own one, it doesn’t hurt to get a look at one. A depth finder will help quickly identify unseen structure and schools of baitfish. I use a Fishing Buddy from Bottom Line on rental skiffs. A drift sock or drag chain is helpful in slowing down your drift in breezy conditions even when renting a boat. Some anglers like to tape their thumbs to avoid a serious case of “bass thumb” that often is the result of a successful day. I like to carry some sort of instant hand sanitizer, like that sold under the Purell label. Also included is a small first aid kit containing packets of antiseptic to treat those inevitable spine punctures. If barracuda are around it is nice to have wire for bite traces. Surflon, from American Fishing Wire Company, is a fantastic coated multi-filament wire that you can tie standard knots with. Although costly, it is very easy to work with. When fly fishing for bay bass, catches of other species is a regular and often exciting part of the game. On San Diego Bay the catch may include Mackerel, Halibut, Barracuda, Corbina, Shortfin Corvina, Yellowfin Croaker, Spotfin Croaker, White Croaker, White Sea Bass, rays, and rarely, Bonefish. Yes, there are Bonefish in San Diego. They may exist in other bays in southern California. No, San Diego will not be the next hot bonefish destination. There are not enough fish nor does the environment match what most of us imagine when we think of a bonefishing destination. 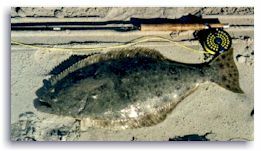 The rays will generally be the most difficult fish to land – they reach sizes in excess of 100 lbs. The Barracuda, Croaker, and Mackerel will be the most common catch. The ‘cuda and macks will be found more often in the outer bay – the croaker in the back bay and around marinas. During El Niño years, Bonito and Yellowtail may be taken in the outer reaches of the bay. 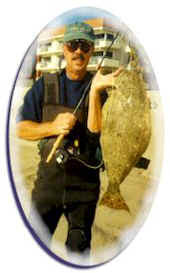 Similar catches may be expected in other southern California and Baja waters. Other strange critters are occasionally taken, brought here in the water ballast tanks of large ships. A Snook was caught in San Diego Bay awhile back, for example. As already discussed, tidal movement plays a large part in fishing success. Fishing can be productive at any point during the tidal phase. However, to summarize, the best fishing will be generally be during the second half of a rising tide and first half of a falling tide. Usually the greater the difference between the high and the low, the better the fishing. [Editor’s note: these types of tidal swings occur on new and full moon periods – Spring tides]. Catching and releasing fifty fish on the last half of a rising tide is not unusual during the summer with half that total being about average. Smaller counts are to be expected during other phases. Skunks are rare. The wind will usually come into play at some time during the day. On southern California waters the prevailing wind is from the west or northwest. During the late spring and summer, mornings will often be calm but the breeze will begin to build as the day progresses. On San Diego Bay this will typically be around 11:00 a.m. The breeze will usually peak at 10-15 knots and then subside at sundown. Accordingly, morning, evening and even night provide optimal conditions. Fishing at night can sometimes be quite magical with the lighted skyline in the background. On a highly developed water like San Diego Bay it never really gets dark. During the fall through early spring the wind is much less predictable in both direction and intensity and it pays to heed the weather forecast. Despite the less predictable weather, fishing during this period may be productive at times. Colder water makes the fish a bit more sluggish but they can be enticed to eat a fly. The eel grass flats are usually less productive at this time with most of the best fishing coming from along the transitional zones between the flats and the deepwater channels. This is the time when leadcore shooting heads really shine. 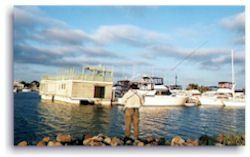 San Diego Bay and Mission Bay, its neighbor to the north, are among the most easily accessed of our coastal fly-fishing venues. Roads encircle both waters and hotels and resorts dot the shoreline. Military bases, private marinas, waterfront business/industries may limit access to some portions but public access to productive areas is plentiful. 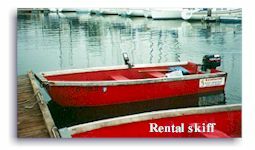 Skiff and boat rentals are available through hotels or boat rental operations. 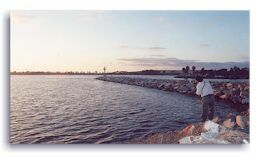 San Diego Bay offers free, public launch ramps at Shelter Island, Glorietta Bay on Coronado, and J Street in Chula Vista. The much smaller Mission Bay sports a greater number ramps. 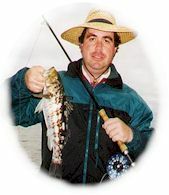 Fly fishing guides are available through local fly shops for those who may want to avail themselves of such services. stripers wherever they’re found. However, in southern California we have a fantastic, convenient, saltwater fishery right in our own front yard. 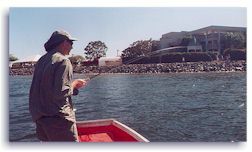 San Diego Bay and other regional waters provide conveniently located and productive angling venues with a variety of species for both novice and experienced anglers, alike. These bays and their myriad species are all well suited for the visitor with a few hours, or for locals with time for exploration. It is a fishery that welcomes the fly angler with plenty of room and incredible fly-rodding opportunity. This entry was posted in Authors, California, Craig Smith, Fly Fishing Destinations, Tackle and Techniques Magazine. Bookmark the permalink.